When I was eight years old, my family left our home in Utah, drove past the Grand Canyon, and settled in the Phoenix area. We said farewell to our beloved mountains and canyons but gained an expansive sky with insanely beautiful sunsets. And blistering heat. And thorns. And an endless supply of dirt and rocks. Getting used to the landscape was a process, and I never stopped missing the change of seasons. (Seriously…is it fall yet?) One thing that I did eventually learn to love about The Great Southwest, however, was the abundance of Mexican food. I will admit that, as a child, I did not appreciate the local cuisine. I grew up in a home where bland was the name of the culinary game. Onions and peppers never graced our table and spices only appeared in tiny quantities on rare occasions. I don’t remember ever tasting a single fresh herb in my youth. Quite honestly, I didn’t realize you could eat green leafy things unless they looked like iceberg lettuce. Given that background, you can understand why Mexican food was not my cup of tea as a youngster. It was a little overpowering for my boring taste buds with all those spices that made my mouth burn. Salsa was the epitome of disgusting in my young mind. Granted, it came from a jar with the word Pace on the front. Fresh ingredients were nowhere to be found. But I simply did not understand how anybody could appreciate such a culinary concoction, even if it was made in San Antonio. I wanted my chips plain, thank you very much. You can imagine my surprise when I left home and started to realize that there was a whole world of flavor that I had been missing. What was this delicious thing called cilantro? And fresh basil paired with tomatoes, mozzarella, and balsamic vinegar was a gift from heaven. Slowly, I expanded my dietary horizons to include things I thought I would never like. Mexican food, with its array of spices, was back on the table. But this time, the salsa was made with fresh tomatoes, onions, jalapeño, garlic, cilantro, and a splash of lime juice. The fresh ingredients made all the difference, creating a fiesta in my mouth. 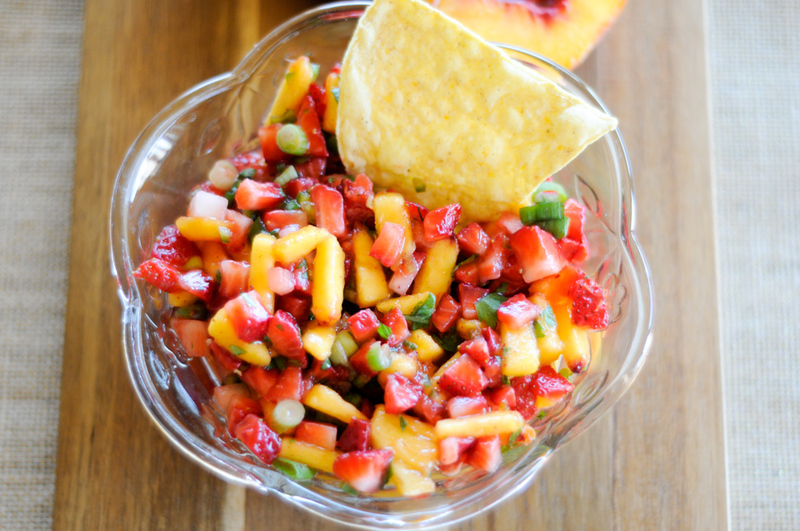 After learning to love the savory version of salsa, I began taking it a step further by inviting fruit to the party. That was a game changer! The sweet and somewhat spicy blend of fruit, onions, garlic, and peppers combined with the salty crunchiness of tortilla chips made my taste buds do a happy dance. Today’s version is perfect for summer’s bounty of peaches. 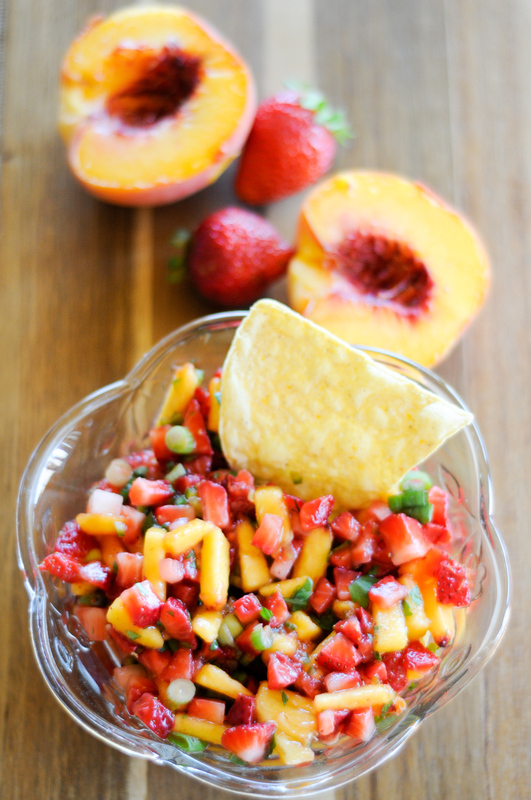 Strawberries are the perfect compliment, but you can also experiment with other varieties of fruit (mangos and pineapple would also pair well with peaches). I don’t know about you, but chopping is highly therapeutic for me. I love to stand in the kitchen when my kids get home from school in the afternoon and chop away while they are doing homework (or running around the house screaming like banshees, if we are being real). This recipe is perfect for chopping therapy because a knife, a cutting board, a bowl, and a spoon are the only things required to make a mouthwatering snack. Start with the peaches, skinning and dicing them before tossing them with a splash of pineapple juice to prevent browning. 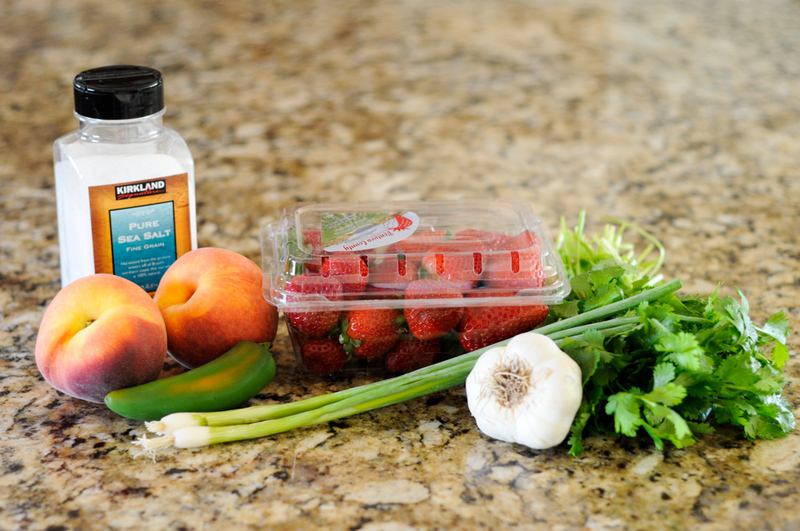 Then chop the rest of those fruits, veggies, and herbs and add them to your peaches, finishing the mixture with garlic and salt to taste. This salsa is delicious with tortilla chips, on tacos and burritos, and as a garnish on grilled chicken or pork. Now give it a try! 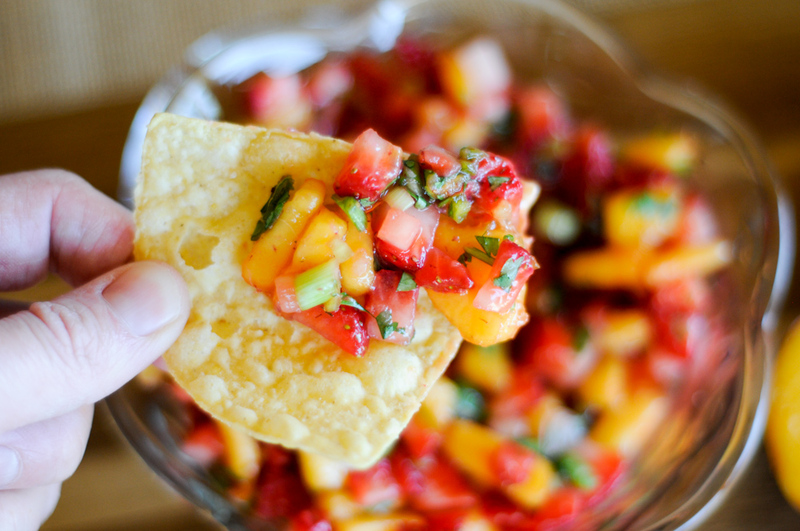 This sweet and somewhat spicy salsa will provide a fiesta for your taste buds. It is delicious with tortilla chips, on tacos and burritos, and as a garnish on grilled chicken and pork. In a medium bowl, toss diced peaches with pineapple juice. Add diced strawberries, cilantro, green onions, jalapeno, and garlic. Mix well. The seeds in the jalapeno will add more heat. Use them if you would like a little more of a kick. If you would like a mild salsa, you can substitute sweet peppers instead, or leave the peppers out altogether. Any acidic juice can be used in place of pineapple juice (orange, lemon, lime). Or use a few vitamin C crystals mixed with water.